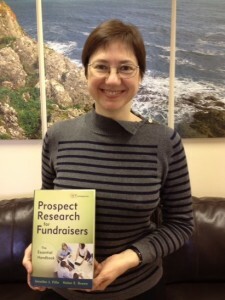 Prospect Research for Fundraisers – the Book! Look at what arrived by special delivery today! It’s an advance copy, meaning that for all of you who pre-ordered (and thank you for that, by the way! ), yours will be arriving very soon. If you haven’t already ordered it, now’s the time to get your very own copy hot off the presses! Just click that little book cover over there on the right to buy it at a discount (!). It will be on your doorstep in no time. This book has got everything anyone working in fundraising needs to know about prospect research. You’re going to love it. Thank you to everyone who was involved: those who agreed to be interviewed, who were the subjects of case studies, who provided quotes and who read (and re-read!) drafts and offered sage advice and suggestions. And the biggest thank you to my co-author, the awesome Jen Filla.